Office Restroom Cleaning Services: What’s Included for a Bathroom Deep Clean? Office bathroom cleaning from a reliable restroom cleaning service keeps your restrooms clean and tidy at all times, which is critical as the bathroom is a prime location for bacteria and viruses to originate. The best way to keep your staff healthy is to make sure that all bathroom surfaces are cleaned, sanitized and disinfected throughout the week, while surfaces such as tile and grout are periodically serviced as part of the bathroom deep clean. What is the Plan for Commercial Restroom Cleaning Services? Toilets and urinals must be cleaned and sanitized regularly to keep them looking and smelling fresh. The handles on the fixtures need special attention as people not only use them with their germy hands, but sometimes activate them with their feet. Stalls, cubicles, and areas near urinals must also be sanitized as people have touched the surfaces after using the restroom. The faucets, soap dispensers, and paper towel holders near sinks are frequent touch points for people with germy hands and need frequent cleaning and sanitizing. Floors, whether they are made of vinyl or ceramic tile, need frequently sweeping and mopping. Grout between ceramic tiles accumulates dirt and bacteria and occasionally needs the attention of a cylindrical brush floor machine. Often the same person is assigned the task of cleaning a particular restroom to ensure consistency as they sign off that every task was completed on a regular basis. When it comes time to do the bathroom deep clean for grout and tile, the same person may be involved as well for quality control. Besides including a specific plan for the cleaning of every item in your restrooms, your plan should also address how your commercial office restroom cleaning service will prevent cross contamination. Using the same cleaning rags in different areas of the bathrooms, using the same water, or using rags and mops used in bathroom areas elsewhere in the facility will spread the germs. While the room might look clean, it will still be unsanitary and pose risks that can compromise employee health. While the goal of office restroom cleaning services is to clean, sanitize, and disinfect the area, it is also important to use the greenest and least toxic products to do the job, while implementing the safest procedures to prevent the spread of germs. Some night cleaning companies use steam pressure cleaning to attack hard-to-reach areas and minimize the need to touch contaminated areas. 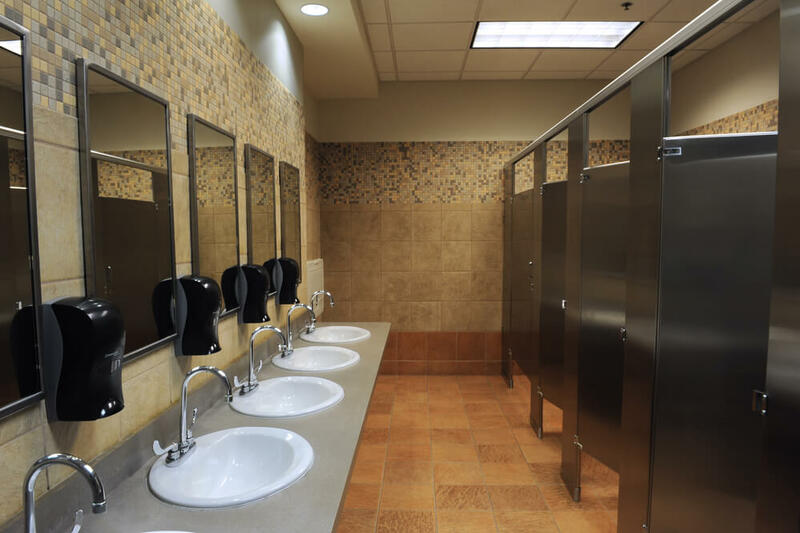 When selecting a provider for commercial restroom cleaning services, make sure to choose one with a plan for correctly cleaning all surfaces on a regular and periodic basis. For excellent service and accountability, contact Bearcom Building Services for a free onsite consultation and estimate for your commercial bathroom deep clean needs. Learn more about our office cleaning services and why you should choose BearCom Cleaning Services.